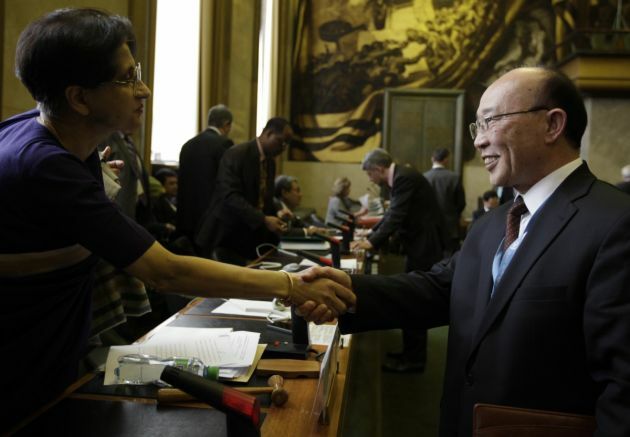 (Photo: REUTERS/Denis Balibouse)So Se Pyong (R), North Korea's ambassador to the U.N. in Geneva, shakes hands with India's Sujata Mehta, president of the conference, at the end of a session of the Conference on Disarmament at the United Nations in Geneva February 27, 2013. North Korea accused the United States on Wednesday of contributing to an "unpredictable" situation on the divided Korean peninsula and abusing its power in the U.N. Security Council to impose its "hostile policy" against Pyongyang. Non-governmental groups, often known as civil society that include faith-based organizations, have been denied access to a key United Nations group that deals with disarmament, evoking the ire of senior World Council of Churches officials. "With governments spending record sums on arms, the world desperately needs a multilateral negotiating forum dedicated to disarmament," said Peter Prove, director of the World Council of Churches, Commission of the Churches on International Affairs. "It used to have one, here in Geneva. It is called the United Nations Conference on Disarmament (CD) and it has just tried – for the 18th year in a row – to agree a programme of work. It has failed again, spectacularly," said Prove. Prove was quoted in a Feb. 24 WCC statement following the collapse, early in the 2015 U.N. disarmament session, of efforts to agree on the year's work including civil society participation. The rejected move would have seen expanded membership and repair of the "the CD's chronic dysfunction" said Prove. The Geneva-based CD is the world's only permanent multilateral disarmament negotiating forum. It was established in 1979 as a belated response to the high-stakes nuclear arms race of the Cold War. The CD's successes include a 1996 treaty banning all nuclear tests, its last achievement to date. Inviting civil society participation is a long-pending change at the CD that is directly relevant to churches. All civil society organizations, including the WCC, are excluded from the CD. The CD President, Ambassador Jorge Lomónaco of Mexico, presented three drafts on the topic early in the session. Many States have spoken in favour of the change over the years, yet the matter has rarely come close to a decision. Prove said that in the end, the United Kingdom objected, which any State may do and thus deny the required consensus. "Defeat came again at the hands of the few—the nine nuclear-armed states whose actions favour the unstable status quo instead of negotiating more security for everyone," said Jonathan Frerichs, WCC program executive for peace building and disarmament. "The only sign of progress this year was that the case for fixing the CD was made well enough that one of the nuclear powers had to show their hand and actually block reforms," he added. Those without the will to negotiate (about nuclear weapons) are few, he noted. What shall the rest of us do until that political will finally appears? One answer is apparent outside the CD. With strong civil society support, including support from churches, a global majority of nation States is being built around the need to ban nuclear weapons on humanitarian grounds, with or without the nuclear-armed nations.